Every couple wants their wedding invitation to be different from anything they’ve ever seen. They want their guests to take it out of the envelope and exclaim, “This invitation is so them!” Making an invitation your own doesn’t mean having to re-invent the wheel, however. It doesn’t need to be origami or make sounds—just a subtle yet distinctive detail or two is enough to give it personality. 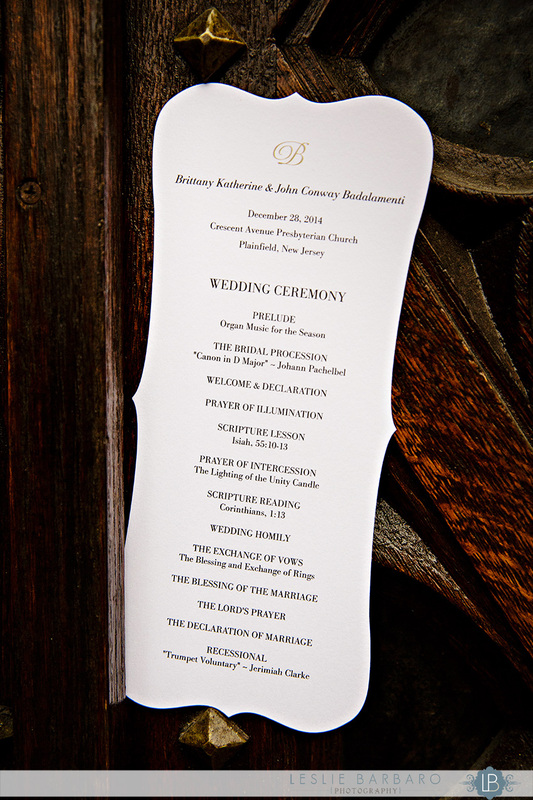 For Brittany and John’s winter wedding in New Jersey, that included the first initial of their new last name in a lovely script font and romantic die cut edges. Here, Brittany talks to us about her bi-coastal invitation ordering process and why you might want to brush up on your font knowledge. John and I grew up in the same hometown but attended different schools. One of my good friends happened to be John's neighbor and shared with me that he went to the college that I had chosen to attend. John, being two years older, offered to take me out to lunch and show me around campus during my first week (smooth move!). You could say we've had many lunches since then! Proposal: We traveled to Maui to celebrate John's sister, Catherine's birthday. The day after we celebrated Catherine's birthday, we went for a morning stroll where John got down on one knee during the sunrise and popped the question. The double rainbow that appeared was the perfect touch to a special moment! We ended up ordering our invitations at Papyrus in Westfield, NJ. We wanted something that was classic and timeless, as well as on theme with our white and gold color scheme. Being that we lived in California and were planning the wedding cross-country, my mom actually played a big part in the invitation process. She met with Papyrus in NJ while we met with the one in San Francisco. Thankfully, Papyrus was in both places, which made the process easier! 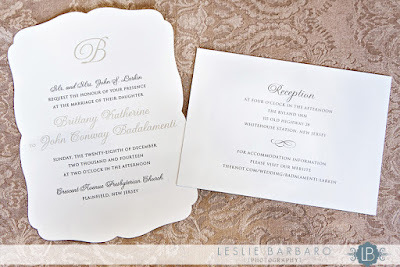 Describe the invitation suite you ended up with and why you fell in love with that design.My husband is a designer, so we had a pretty good idea of what we were looking for and knew when we found it! We loved the letterpress effect on invitations, so we sought out that style. 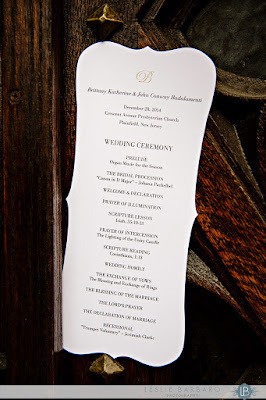 We also wanted an invitation that was different from anything we had seen before, and that is why the curved edges stood out to us. Our gold and white color scheme was reflected in our invitations with the gold font and gold lined envelope. We also knew we wanted our "B" monogram at the top because this was going to be our new last name together and we wanted it to be a focal point. We felt this invitation set the stage for our special day and also represented us. There are a lot of fonts that I never knew existed! Asking your invitation place for advice is helpful, as they have been through it with couples many times before. It feels good to have an invitation that not only sets the tone for your special day but reflects you and your future husband's personalities. Have fun with it and stick with a style that makes YOU happy! 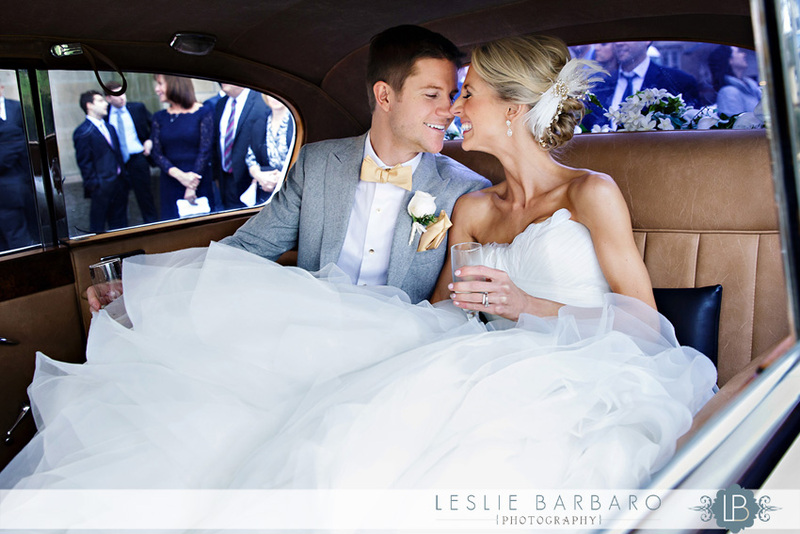 All photos courtesy of Leslie Barbaro Photography.